The Austrian car factory ÖAF - Gräf & Stift AG Wien/A, a subsidiary company of the MAN, manufacture the trolleybuses. The vehicle's electrical equipment was manufactured by KIEPE ELEKTRIK GmbH & Co. KG Düsseldorf/FRG. The vehicle is based on that worked satisfactorily MAN - city bus type SL 202 with the advancement on the low floor. This trolleybus is a three-axle, four-door vehicle, in which the c-axle (you read correctly, the last axle) is propelled. The trolleybus has four 1.25 m wide doors. The windscreen and side windows are glued into place. The front, back and roof lining are made of plastic. The vehicle front and the rear walls have been fitted with large electronic information systems. They show the line number and the destination. A trolleybus of this type is very modern. 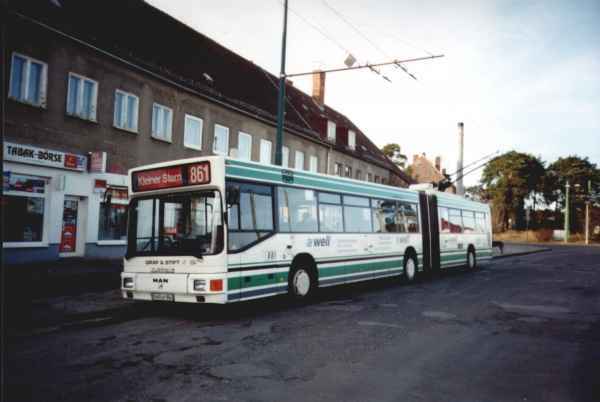 The trolleybus of this type is an ingredient of a modern urban trolleybus opration system. One driver, without conductor, can work safety with this trolleybus. The door closing mechanism has highest safety standard. If a passenger is between the doors while closing, the doors immediately open again. They are monitored with light barriers and pressure mats. The driver open and close the first door. The driver only releases the doors 2, 3, and 4. Press buttons allow the passengers to open and close the doors 2, 3, and 4. both from inside and outside when halting at stops. The doors close automatically. The automatically closing of the second door can switch off by the driver and also by the passengers. This facilitates the entrance for wheelchair users and also mothers with buggies. The articulated trolleybus has very good heating and ventilation, above all quietly. The ventilation of the vehicle is realized by two dormer-windows on the roof. The driver can open the dormer-windows with electric mechanism. In the roof of the rear of the articulated trolleybus are two electric ventilators. These two electric ventilators can be opened or closed however unfortunately also by the passengers. A technical modification at the electric ventilators would be therefore desirable. 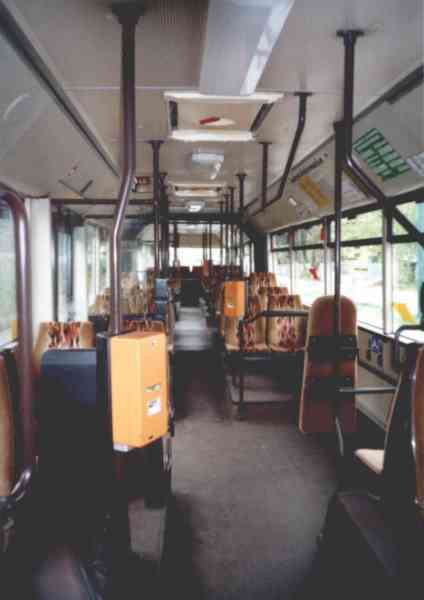 Folding windows at the left side of the articulated trolleybus can be opened. Independent electric heating with three-level control of the heating capacity as well as a three-level control of the air supply are used to heat the driver's seat and to defrost the windscreen. The drivers seat is ventilate by 3 electic ventilators, whereof two electric ventilators can used for heating. The heating of the passenger room is realized by 4 electric radiators situated beneath the seats. They are equipped with ventilators. The heating of the passenger room is controlled automatically by two sensors located within the passenger room. The height of the floor above the roadway is 340 or 370 mm in the front car. In the rear of the front car the floor rises until the axle centre to the necessary height for axle and ball race and amounts to 610 mm in the entire trailer. Furthermore the right side of the trolleybus can be lowered around approx. 100 -150 mm (so-called "kneeling"). This facilitates the entrance for wheelchair users and also mothers with buggies. The types of tires used are 275/70 R 22,5 148/145 L. B- and C-axle are each dual-tires. Rims of the size of 22.5 x 7.5 according to DIN 78022 are used. The front wheels are balanced. The maximum noise level inside with 50 km/h amounts to 74-dB (A). With more acceleration the drive by noise level (at a distance of 7.5 m from the trolleybus) is 81 dB (A). The vehicle has 47 seats inclusively driver's seat and the maximum number of passenger related to the vehicle useful area is 130. The vehicle is equipped with pneumatic cushioning and shock absorbers, 2 at the A-axle, with 4 shock absorbers and air cushions at the B- and C-axles. The pneumatic cushioning is sometimes quite taut or hard especially at bad road surfacings (Unfortunately, we have some one!). The vehicle is equipped with a ZF-Kugelmutter-Hydrolenkung (steering) of the type 8098. 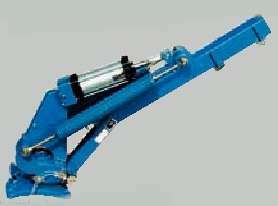 The guidance assistance pump is a radial piston pump and is propelled by the electric driving motor. 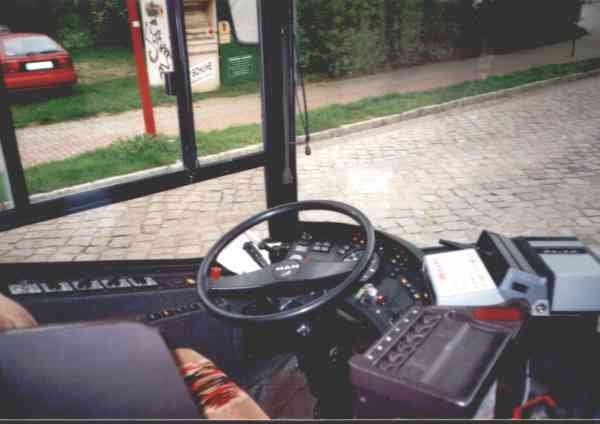 The guidance assistance functions only at speeds above 6 km/h, thus at some bus stops steering control is limited. The steering wheel is adjustable. The three-phase current traction equipment consists from the newly developed direct pulse inverter (DPU) with GTO-technology (gate turn off thyristor) combined with the rubust and maintenance-free three-phase asynchronous motor. The DPU is controlled by a microprocessorized electronic drive/brake control unit (EFB). Besides controlling the operating sequences, the EFB offers the possibility of recording service data and has a fault/data memory (KIEPE Diagnostic Aid) which can be read by means of a normal PC and analysed on the spot by the transit authority or by data transfer via modem to the manufacturer. The articulated trolleybus achieves with a gear ratio of 10,045:1 a maximum speed of 60 km/h, a acceleration of 1,3 ms2 and a deceleration (electricaly) of 1,1 ms2. The trolleybus is equipped with current collector of the type OSA 234. These current collectors are equipped with a pneumatic device for rapid lowering of the pole when dewiring. This device replaces the spring loaded retriever. At each current collector is fixed a cable with a automatic system to roll up the cable. With this cable the driver can put on or remove the current collectors from the trolleybus overhead network. Sensors indicate the dewiring. The auxiliary power supply system of the trolleybus was provided by an static converter of the type BNU 102. The static converter generate 3 AC 380/220V, 6 kVA, 100 Hz and also DC 24V, 110 A. The static converter of the trolleybus is the substitute for the generator of other cars. 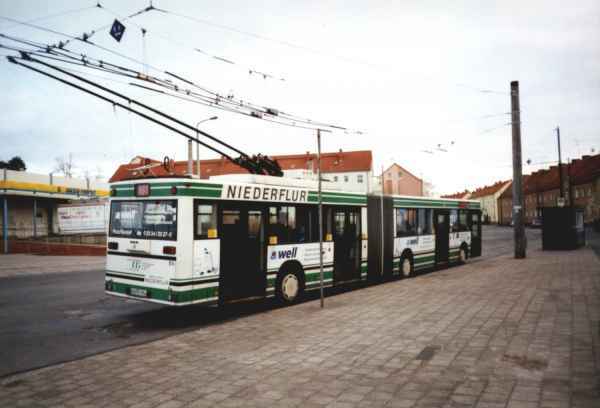 The vehicle is equipped with a emergency driving mechanism (called "the emergency power generator"), whereby the trolleybus of the type ÖAF-Gräf & Stift NGE 152 M17 can be driven for short distances without the overhead line. The emergency driving mechanism is located in the trailer (left side, forward of the 3rd axle), and is propelled by a Diesel engine from VW (Volkswagen). It is a water cooled 4 cylinder Diesel engine with a power of 49,8 kW at 4000 rpm. 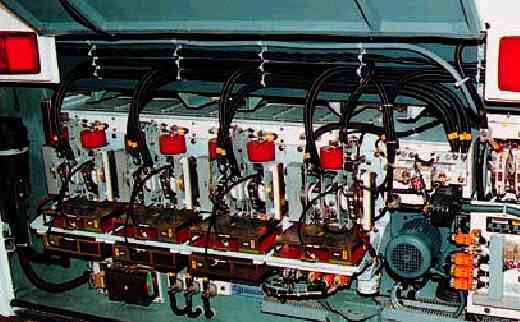 The water cooled 4 cylinder diesel engine drive a three-phase synchronous generator. It generate DC 400 V, 38 kW. The fuel tank is on the right side forward of the 3rd axle, and has a capacity of 42 l.
The modern electric and electronic equipment of the articulated trolleybus of the Austrian type ÖAF Gräf & Stift NGE 152 M17 bring a high profit of safety, efficiency and economy. Sometimes the vehicle has a large susceptibility to failure because of the assigned electronics require frequent repairs. ÖAF Gräf & Stift NGE 152 M17.